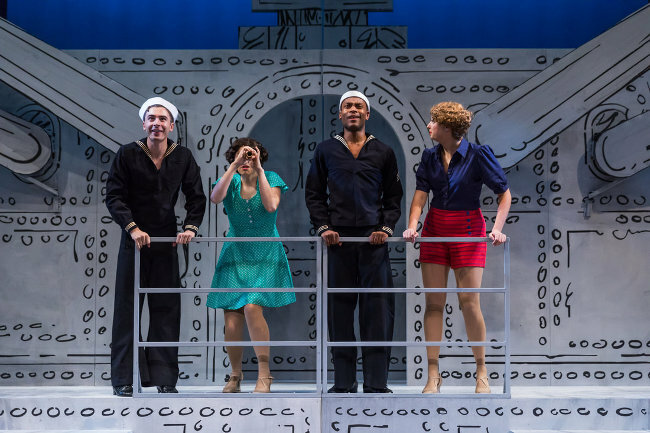 Dames at Sea, Book and Lyrics by George Haimsohn and Robin Miller, Music by Jim Wise, Director and Choreographer, Ilyse Robbins, Assistant Director, Daniel Begin, Music Director, Steven Ladd Jones, Production Stage Manager, Rachel Sturm, Scenic Design Eric Levenson, Costume Design, Emily Taradash, Lighting Design, Chris Fournier, and Sound Design by John Stone, runs September 7-24, 2017 at the Greater Boston Stage Company. It’s opening night and the last chance for a 1930s Broadway production company to survive financially. Will there be love? Names in lights? 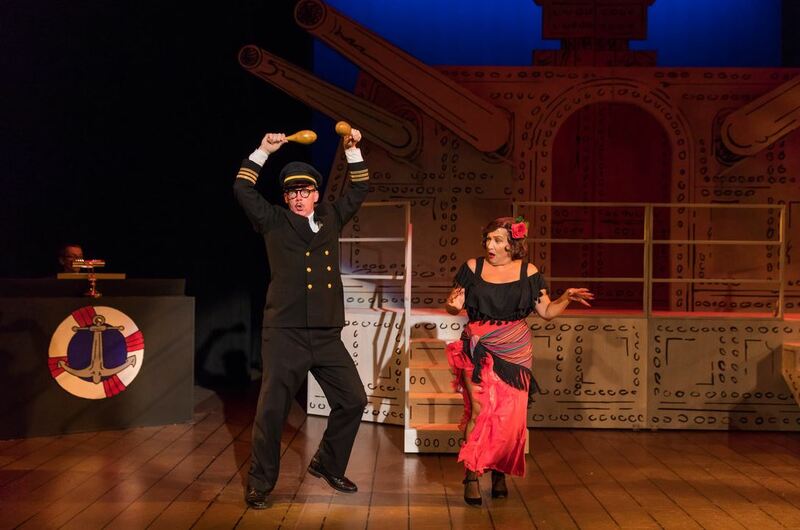 This parody of old time Broadway comes with singing, dancing, comedy, and tap dancing! Oh my! Shana Dirik stole the show as the troublesome but hard to hate Mona Kent, the celebrity actress who takes the lead in the production. She heightened the comedy in every scene and song with physical humor and her comical reactions to the action. And she is followed by a strong cast of five others, all of whom can tap dance and sing. The play, written in 1966, uses stereotypes to comment on the 1930s, so that we don’t get deep, unique characters to really care about in the show. There’s not much at stake in the predictable plot, and for example a lover’s quarrel is quickly resolved without lasting consequence, and corny lines such as “living without you wouldn’t be fun”. But the production at The Greater Boston Stage Company takes what’s in the script to the next level. They take many creative risks, with the staging by Eric Levenson being cartoony and suggestive, playing with the spotlights, and breaking out umbrellas and rain coats during a dance number. There’s a heart-breaking innocence and earnestness about the characters who want to be stars — something no doubt that the actors have themselves felt. The choreography, even for scene changes, is fluid and interesting, with joyous energy. The singing was powerful and moving and the tap dancing truly delightful — will bring a goofy smile to your face of a more innocent time (that never was of course, but never mind). I thrilled during one song, Choo-Choo Honeymoon, where two lovers croon about wanting to marry someone “just like you”. The most hilarious song may have been “The Beguine”, about a romance that of course didn’t happen in an exotic location like Paris but just in Pensacola. Kudos to Russell Garrett, who shared this song with Shana Dirik, as the lovestruck naval captain. Ephie Aardema as Ruby also shone in scenes like an actual “Come on guys, let’s put on a smile!” cheer up song. Not everything was perfect. The lighting was basic, Mona seemed at times selfish but then helpful, and the plot had few twists. But I can recommend Dames at Sea without reservation with 4 out of 5 stars. Travel back to yesteryear and the show must go on!